An azalea show will open on April 15 for a month at Zuibai Pond Park as part of the venue's culture-themed spring garden tour. 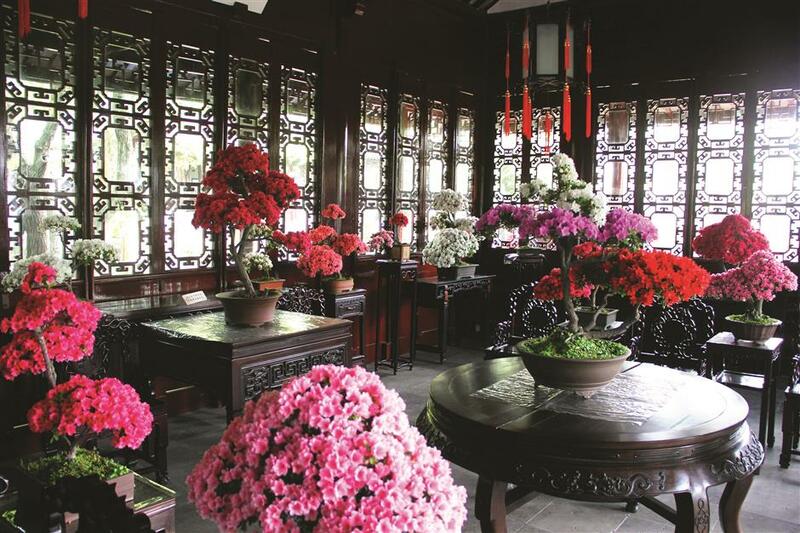 Potted azalea flowers and bonsai will be on display in Zuibai Pond Park. An azalea show will open on April 15 for a month at Zuibai Pond Park as part of the venue’s culture-themed spring garden tour. A total of 800 pots of azalea, of more than 70 varieties, will be exhibited throughout the park. Among them, elaborate pots will be displayed in ancient buildings, halls or along corridors. Azaleas will also be planted at each garden within the park. By that time, a set of azalea bonsai will welcome visitors at the park’s west gate. As one of China’s top three natural flowers (the others are primrose and gentian), azaleas are regarded as “the beauty queens” of Chinese flowers. Legend has it that a king in ancient Sichuan Province stepped down and crowned a minister of great contribution. The country later perished against his will. When he died his soul turned into a cuckoo that cried so much that crimsoned azalea the flower. Both cuckoo and azalea are pronounced as dujuan in Chinese. Jointly put forward by Shanghai Binjiang Forest Park, Fangta Park and Zuibai Pond Park, the azalea show aims to promote China’s azalea culture, build up exchanges on flower arts and sharpen techniques on azalea planting. The one-month spring culture art festival will include garden tours, spring outings, flower shows, scenery appreciation and chess playing. Both online and offline interactions with visitors will be adopted. Other events to be held during the flower show are a children’s chess competition, local stand-up comedy performances, traditional operas and treasured bonsai exhibitions.